We care for you like a family. The mission of Lake Forest Home Care, Inc. is to assist seniors in accomplishing their tasks and activities of daily living wherever they are most comfortable and secure. We do this by providing professional and experienced support staff in private homes or in care facilities. Whether it’s 24 hours, seven days a week, or short-term hourly care, we have trained caregivers to assist you. Lake Forest Home Care, Inc. was established to provide senior care in Lake Forest, California to senior citizens within the comfort of their own homes. 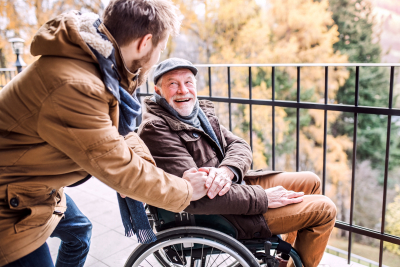 Our caregivers ensure to assist our client’s needs and requests to make sure they have a comfortable and independent lifestyle while receiving the care they need to stay safe and live happier lives. We have had years of experience in assisting people with various physical, emotional, and mental difficulties. The services we offer are here to help you achieve your health goals by assessing your situation and designing a care plan that suits your personal needs. Started in January 2004 as a single proprietorship by its current administrator, Ms. Marilou Galan. Its operation was housed in her home garage. Within three years, the business grew from two clients to 20 and from 4 caregivers to around forty individuals who are well experienced and very caring caregivers. Due to the growth of the business, the office moved to Aspan Plaza in the City of Lake Forest and was incorporated on May of 2008. In 2014, the company joined the prestigious California Association for Health Services and was certified by the Home Certification Standards for Home Care Aide Organizations. This strict certification process demonstrates that the Company has met or satisfied the Certification Standards with respect to the conduct of its business. Lake Forest Home Care is duly licensed by the State of California Department of Social Services to operate as a home care organization with license number: 304700068. Currently, Lake Forest Home Care have been servicing Senior facilities like The Covington, Brookdale of San Juan Capistrano, Villa Valencia, Flagship Healthcare Center and Atria Senior Facilities just to name a few. The company have also been servicing several clients in their private homes. Marilou D. Galan: Currently the company’s Administrator with more than fifteen years of experience as a Certified Nursing Assistant (CNA) and a Certified Home Health Aide (CHHA). Ms. Galan has been an advocate of professionalizing in-home caregivers. She developed the company policy of providing training and continuing education for the company’s caregivers. All our in-home caregivers are bonded and covered by liability insurance. Our caregivers are employed by the company and as such are covered by workers’ comp insurance and also disability insurance. Our service rates are very competitive and we have very flexible service hours to meet our client’s needs which ranges from 2 hours to live-in. We maintain a huge pool of experienced caregivers, so at a moment’s notice, we can have a replacement caregiver to service our clients.